You no longer have to be Donald Trump to afford a building in Manhattan. Starting June 19, everyday investors will be able to back real estate projects with Kickstarter-like crowdfunding initiatives. Many commercial property developers are now using crowdfunding platforms to raise capital for their projects. That means people who want to invest in billion dollar properties now have access to once unapproachable real estate projects -- albeit for very small shares of the business. Simon Baron Development Group, a New York based real estate developer recently announced that it is using the services of CityFunders to crowdfund $1 million in equity for the development of a Long Island City rental tower. Earlier this year, Fundrise, a Washington based crowdfunding company, offered investors the opportunity to buy bonds backing the 3 World Trade Center development in Manhattan. The cost: $5,000. "Investing in commercial property is generally very capital intensive," said Heather Schwarz Lopes, chief strategy officer of Early Shares, a crowdfunding platform that focuses on real estate development. "Now investors can start at a lower price level." Shares in commercial real estate normally start with minimum investment of $5,000 to $25,000. 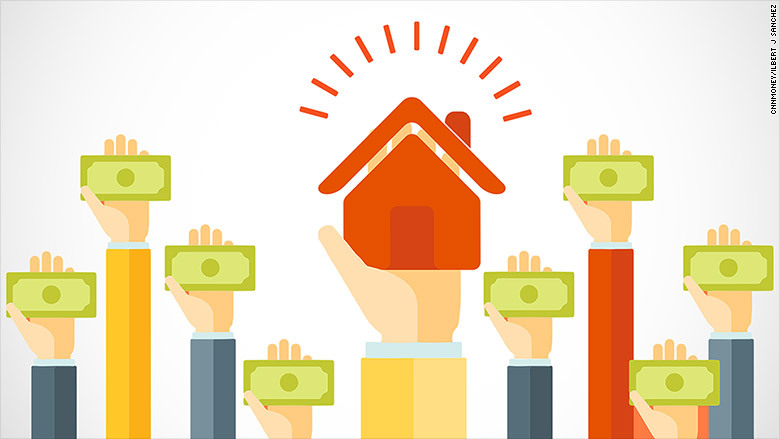 Crowdfunding for properties and other equities had only been available to accredited investors with a net worth of more than one million dollars or an annual income of over $200,000. But following the passing of Jumpstart Our Business Startups Act in 2012, the SEC is set to release new rules that allow anyone to take part in crowdfunding equities. Those rules are scheduled to take effect next Friday. "[Small time] investors can now invest with the professionals," said Steve Drew, CrowdStreet's products chief. But people without real estate investing experience should exercise extreme caution. Some of the properties are estimating sky-high returns upwards of 13% to 17% after an investor sells his or her stake. A typical investment holding period for each investment ranges from five to 10 years. It sounds too good to be true. And it might be. There is significant risk associated with crowdfunding properties. For one thing, risk valuations on investment projects are evaluated by construction developers or crowdfunding platforms themselves. Unlike traditional stocks and bonds, external credit rating agencies do not offer opinions on the risk associated with investing in crowdfunded properties. Furthermore, like all real estate, these projects are relatively difficult to sell in secondary markets. Dr. Richard Swart, UC Berkeley's crowdfunding research director, acknowledges that property crowdfunding is riskier than traditional investments. However, Swart said he feels that the increasing demand for these kind of crowdfunded projects will drive developers and platforms to be more transparent with the risk involved in each project . He, also noted that crowdfunding in real estate markets can be safer than other kinds of crowdfunding investments, since there is an underlying physical asset associated to each stake. Investors in crowdfunded properties can pick between retail outlets, office buildings or multi-family residential developments. Most of these projects are a cross breed between a bond and a stock. Like a stock, you hold a share in the company that runs the project but you also potentially receive a yearly income. Building developers project an annual income of over 8% return on your capital from rent payments and profits generated from building management.